Developed by UV Software, Berlin. The PCBUSB library realizes a 'PCAN-USB Driver for OS X' using Apple´s IOUSBKit. It supports up to 8 PCAN-USB and PCAN-USB FD devices from PEAK-System Technik, Darmstadt. The library offers an easy to use API to read received CAN messages from a 64K message queue and to transmit CAN messages. Standard CAN frames (11-bit identifier) as well as extended CAN frames (29-bit identifier) are supported. The PCAN-USB FD device can be operated in CAN Classic and CAN FD mode. The library comes with an Objective-C wrapper and a demo App: MacCAN Monitor App. PCAN is a registered trademark of PEAK-System Technik GmbH, Darmstadt, Germany. All software offered below are freeware without any warranty or support! Please note the copyright and license agreements. The PCBUSB library realizes a 'PCAN-USB Driver for OS X' using Apple´s IOUSBKit. The dynamic library libPCBUSB is running on macOS 10.12, x86_64 architecture. The API is nearly compatible to PEAK´s PCANBasic DLL. See the doxygen documentation and the header-file for details. Support of PCAN-USB FD devices in CAN 2.0 mode (CAN classic) and CAN FD mode! Adapted the API according to Peak's changes in version 4.2.0.134 and harmonized return codes with it. Fixed issue #208 'CAN_Write stuck when errors on the bus are present'. Conducted an intermediate solution for issue #246 (writing into a trace file). Added run-path-relative install name to the library (using the @rpath macro). Adapted the API according to Peak's changes in version 4.1.0.96 and harmonized return codes with it. Implemented parameter PCAN_CHANNEL_FEATURE and PCAN_BITRATE_INFO. Parameter PCAN_RECEIVE_EVENT returns a file descriptor to realize 'blocking read' by select() as on the Linux implementation of the PCAN-Basic API. Feature 'Reading/Writing of parameter PCAN_DEVICE_NUMBER' implemented. Fixed issue #104 'Hot plugging was not detected by the library/driver'. Fixed issue #117 'Permission for libPCBUSB.x.y.lib wrong' (chmod 755). Return codes of API functions harmonized with PCANBasic.dll (1.3.3.61). Time-stamps are now taken from CAN controller instead of taking them from the system clock. Getting and setting of PCAN_* parameters reworked (to be almost compatible to the PCANBasic DLL, version 1.3). Resetting of RCV queue and XMT queue on the CAN controller realized. Fixed issue #11 'All channel initialized by the application will be closed even if they are in use'. CAN_Unitialize: closing all channel initialized by the application at once implemented. CAN_Read: receive queue overrun handling reworked. CAN_*: wrong function return codes corrected. CAN_GetErrorText: language support for English, German, French, Italian and Spanish added. Older versions of the PCBUSB library can be downloaded from here. 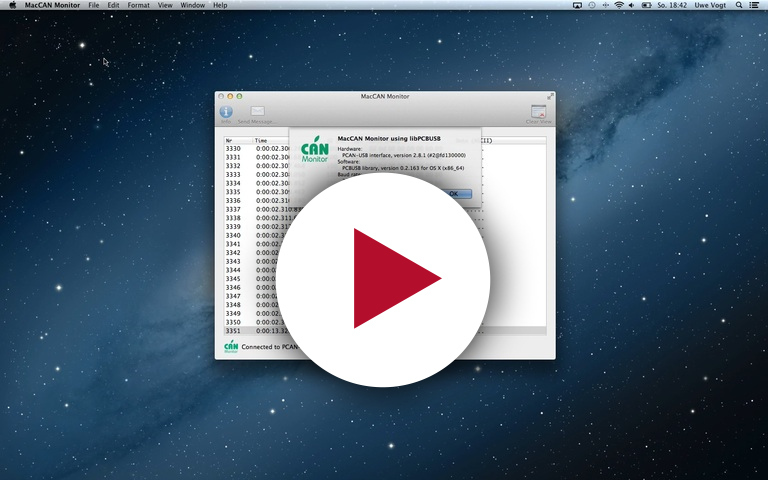 The MacCAN Monitor App is a demo program to show the functionally of the PCBUSB library. The program displays received CAN messages in a table view; its size is limited to 1024 rows. Furthermore it is possible to send single standard CAN messages with 0 to 8 data bytes. Older versions of the MacCAN Monitor App can be downloaded from here. If you prefer to work in a terminal session, here is a command-line version of the CAN Monitor application. The command-line tool 'can_moni' runs as a standalone program, therefor it is not necessary to install the PCBUSB library to run the program. Support of PCAN-USB FD interface. Time-stamps are taken from CAN controller. Older versions of the 'can_moni' tool can be downloaded from here. A Linux version of the 'can_moni' tool using BerliOS SocketCAN can be downloaded from here. Copyright © 2013 by UV Software, Berlin. Hardware, software and system solutions for many sectors including automotive, aircraft, machinery and equipment building and consumer goods. Donations to my work are gratefully welcome. © 2012-2018 UV Software, Berlin. All rights reserved.